How are you today? hope fine, my day over here in Dakar Senegal is boring, My names are Amira Ghanem, 21 years old single and never married, I am the only daughter of my Father am from Libya in North Africa and presently i am residing in the camp here in Dakar Senegal, under the control of (www.womenforwomen.org ) as a result of the civil war that was fought in my country. My late father Dr. Shukri Mohammed Ghanem was Director of Foreign Trade at the Ministry of Economy in Libya, and also was the former Chairman and Director of Marketing of Libya' s National Oil Corporation (NOC) and he was also the Prime Minister to the head of state (Muammar Gaddafi). My father died after trying to escape through Tunisia boarder because of the Civil war. Am the only one alive now and i managed to make my way to a West African country Senegal with the help of our family doctor, where i am living now as a refugee. I would like to know more about you. Your likes and dislikes, your hobbies and what you are doing presently, with your recent photos. I will tell you more about myself in my next mail, hoping to hear from you soonest. How are you doing?? i hope that you fine and good, i appreciate your mail to my box,it still show that one can still care for someone no matter what it takes, you are such a nice and a wonderful person, dear that little portion of mail i sent to you was the worst thing that have ever happen to me as a person, i am so sorry that i have to share it with you, but that' s the only way i can get my freedom and at least be happy once again after the sudden death of my parents which has kept me in this terrible condition, but i thank god that some one like you has come into my life, you have giving me a reason to live, my dear i have some thing to tell you, i don' t know if i have to trust you with this little faith of mine, but something in me tells me to let you know all about me, so my dearest one if you are ready to know about me, you shall let me know in your next mail, i will stop here and await your responds. How are you today, i hope you are fine. my dear in this camp we find it hard to go out because we are not allowed to do so, its just like one staying in the prison and i hope by God' s grace i will come out here soon. I don' t have any relatives now that i can go to, all my relatives ran away in the middle of the war the only person i have now is Reverend Michael, who is the Reverend Father of the (Christ the king Churches). As a refugee here i don' t have any right or privilege to any thing be it money or whatsoever because it is against the law of this country. I want to go back to my studies because i only attended my first year in the university before the tragic incident took place, my dear i will like you to assist me in recovery my late father fund, because when he was alive he deposited some amount of money in the Bank which he used my name as the next of kin. The amount in question is $5.7(Five Million Seven Hundred Thousand US Dollars). So i will like you to assist me transfer this money to your account and also assist me to get my traveling documents and air ticket to come over to meet with you in your country as soon as the bank transfer the money, you can reach me true this telephone number (+221775435169 ) please this telephone number belongs to the Reverend father Michael that is in charge of this place. Please i will need the following information' s, so that i will contact the bank and introduces you as my foreign partner. Names . . . . . . .
Age . . . . . . . . Address . . . . . .
Telephone . . . . . I have getting in touch with the bank and made them to know about my plans to withdraw this money, i also got them aware of the death of my father and they have acknowledged it with all there confirmation. However, they advise me to get in touch with a very responsible person who will stand on my behalf and my trustee as regards to this money, that is why i am telling you all this with trust. I thank you once again for your kindness towards me. i know this will bring a new beginning in our life, remember i trusted you so much that is why i am giving you all this information. My Dear this is for you alone. You will have 10% of the total money helping me In this regards and i have mapped 5% for any expenses that might come in this transfer, if there will be any, and the remaining money will be invested in any good business of our choice, while i will continue my studies after the transfer has been done, when am out from here. I will like you to contact the bank immediately with this information, tell them that you are my foreign partner and that you want to know the possibilities of assisting me transfer my $5.7 million dollars deposited by my late father of which i am the next of kin. The contact information of the bank are as follows. BOW BELLS HOUSE, 1 BREAD STREET LONDON, EC4M 9BE. UNITED KINGDOM. Financial Officer: Mr. Stephen Matchett. My dear i am glad that God has brought you to help me out from this situation and i promise to be kind and will equally need your strong support in life plus investing this money since i will be studying as i leave this place. Below here is how you will write to the bank, just fill in the space and send to the bank. I am waiting to hear from you immediately as you get in contact with the bank. I, Mr . . . . . a permanent resident of . . . . . . . wants to put forth the following few lines for your kind favor and quick necessary action at your end, that Miss Amira Ghanem now living in DAKAR SENEGAL, she is in a refugee status. I am her foreign partner living in . . . . . . Republic. I will stand on her behalf. That she is the next of kin to her late father who has an account in your bank with the account number BOI/041178517944/LD/21/B where he had deposited some amount of money for her beloved daughter. That I want to know the possibilities of assisting her to transfer the deposited amount of money to my account in my country. After receiving a reply from you, I will be able to know the procedure of transferring the amount from your bank to my account. Expecting an early reply with regards. Mr. . . . .
Subject: BANK OF IRELAND, UNITED KINGDOM. BELLS HOUSE, 1 BREAD STREET LONDON, EC4M 9BE UNITED KINGDOM. In view of your partner' s request Miss Amira Ghanem for claims, closure and transfer of deposited fund belonging to her late father Dr. Shukri Mohammed Ghanem to you on her behalf, we sincerely apologize for late response, thorough investigation has been conducted and information coincided with what we have in our records. Be informed that before we can effect further transfer, we need to receive the following documents from you to prove that you have been mandated by his next of kin in Senegal Miss Amira Ghanem. 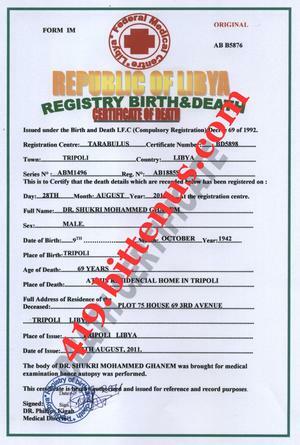 (2) A copy of late Dr. Shukri Mohammed Ghanem Death Certificate. (3) A power of Attorney which must be Signed/Notarized by a Senegal based lawyer. (4) A sworn Affidavit from High Court of Senegal. On receipts of the above mentioned documents, we shall verify them and shall process your claim to effect the transfer into your nominated bank account without delay. Thanks for your co-operation, we strive to serve you better. EC4M 9BE, London, United Kingdom. 1 Bread Street, EC4M 9BE, London, United Kingdom. adheres to the principles of the Banking Code. A copy of the Code is available on request. This e-mail, its attachments and any rights attaching hereto are, unless the context clearly indicates otherwise, the property of Bank Of Ireland Group Plc and/or its subsidiaries (" the Group" ). It is confidential, private and intended for the addressee only. Should you not be the addressee and receive this e-mail by mistake, kindly notify the sender, and delete this e-mail, immediately and do not disclose or use same in any manner whatsoever. Views and opinions expressed in this e-mail are those of the sender unless clearly stated as those of the Group. The Group accepts no liability whatsoever for any loss or damages whatsoever and howsoever incurred, or suffered, resulting, or arising, from the use of this email or its attachments. The Group does not warrant the integrity of this e-mail nor that it is free of errors, viruses, interception or interference. Licensed divisions of the Bank Of Ireland Group are authorized financial services providers in terms of the Financial Advisory and Intermediary Services Act, No 37 of 2002 (FAIS). * BUSINESS AND INDUSTRY * INTELLECTUAL PROPERTY * COMMUNICATION. SEQUEL TO THE MAIL WHICH WE RECEIVED IN MY NOBLE LAW FIRM AND WHAT YOUR PARTNER HAS INFORMED ME ON HOW TO PREPARE AN AFFIDAVIT OF OATH AND A POWER OF ATTORNEY IN YOUR NAME FOR YOU TO STAND ON HER BEHALF AND TRANSFER HER LATE FATHER' S MONEY TO YOUR ACCOUNT,MY NOBLE LAW FIRM WISH TO BRING TO YOUR NOTICE THAT I WILL GO TO THE FEDERAL HIGH COURT HERE IN SENEGAL TO ASCERTAIN THE COST OF THE AUTHENTICATION OF THE POWER OF ATTORNEY AND THE AFFIDAVIT OF OATH BEFORE IT BECOMES VALID FOR THE TRANSFER OF THE MONEY TO YOUR ACCOUNT. I WILL NEED TO RECEIVE THE FOLLOWING INFORMATION FROM YOU. AFTER WHICH MY LAW FIRM WILL CONTACT YOU BACK WITH THE REQUIRED COSTS BEFORE ACCEPTING TO RENDER THE REQUIRED LEGAL SERVICES. Cheikh Law Chambers is a full-service international law firm based in Senegal with over a century of experience. With offices in Dakar, the firm serves a wide array of clients across the legal spectrum. Our legal services are comprehensive as a result of our team' s vast knowledge and skilled Attorneys who offer our clients the top litigation capabilities within our jurisdictions. The use of innovative solutions is the basis for our practices, and makes Cheikh Law Chambers one of the most prominent and reliable firms in the region. My dear i saw your mail, and i want you to understand that my step mother is behind all this that image is not the image of my step sister Vanessa, now i want to tell you a secret which i have not told any body and i am trusting you to keep this only to your self, i am telling you this just to prove my innocence to you, when my late father was in the UK, during his reign as a prime minister for late Gen. Gaddafi, he met my late mother and they fail in love and he married my mother out of wed-luck and they kept it secret due to his political status and career, so after so many years when he resigned, he introduces me and my mother into the family, then after that the family problem began, my step mother threatening to deal with me and my own mother and after the death of my late father, my step mother plan and killed my mother, then i was the next target, but i was very lucky i was saved and helped by our family doctor, she wanted to kill me by food poison, so she did not succeeded, so that is how i ran down her to Senegal, when she discovered that i am in Senegal, she sent some assassins that came after me, because of the wealth our late father left for me and my mother, so she decided to tarnish my image with the with the scam site with fake pictures and documents, i have send you the original documents of my late father death certificate and you will see the differences, and i need you to give me your word, that you will not betray after the bank has transferred this money into your account? waiting to hear from you. SEQUEL TO YOUR MAIL WHICH I RECEIVED TO MY NOBLE LAW FIRM HERE ON HOW TO PREPARE A POWER OF ATTORNEY AND SWEAR AN AFFIDAVIT OF OATH FOR YOU AND YOUR PARTNER, PRIOR TO MY INQUIRES FROM THE FEDERAL HIGH COURT HERE IN SENEGAL,IT WILL COST YOU THE SUM OF($350.00) FOR THE AUTHENTICATION OF THE POWER OF ATTORNEY,($100.00) FOR THE SWEARING OF AFFIDAVIT OF OATH AT THE FEDERAL HIGH COURT HERE BEFORE IT BECOMES VALID,($450.00) FOR NOTARY STAMPING AT THE NOTARY OFFICE BEFORE IT WILL GO OUT FROM SENEGAL,($500.00) FOR MY CONSULTATION AND LEGAL PROCESSING FEE,SO IT WILL COST YOU THE TOTAL SUM OF ($1,400.00) ONE THOUSAND FOUR HUNDRED AMERICAN DOLLARS ONLY TO GET EVERYTHING DONE,YOU CAN PAY IN YOUR LOCAL CURRENCY SRI LANKAN RUPEE AND I WILL RECEIVE IT IN OUR LOCAL CURRENCY FRANCS CFA, SO $1,400.00 USD = 183,200.00 LKR. UPON THE RECEIPT OF THIS MAIL,ON YOUR READINESS I WILL SEND YOU AN INFORMATION WHICH YOU WILL USE TO SEND THE MONEY AND THE DOCUMENTS WILL BE READY IN TWO WORKING DAYS AS SOON AS WE RECEIVE THE MONEY. WE COLLECT MONEY BEFORE RENDERING SERVICES. How are doing today? hope all is well with you as well with your health? darling i understood all the lawyer wrote but i want you to understand the situation that i am into now, i am suffering due to the consequences of war, but i know that my life will be better if this money is released and transferred to your account, darling is just that my condition is bad over here. Concerning the lawyer and the amount he needs from us to get the document for the transfer, darling please help me regarding this issue, i have no one left in the whole world and i don' t have any money and i am not doing anything over here to raise money to pay the lawyer, please help me in paying the lawyer so that he can provide the documents for us. Please help me so that i will be with you as soon as the bank transfer the money, you know that this is the only document that the bank needs from us, i love you and want to be with you as soon as possible, i will be waiting to hear from you.